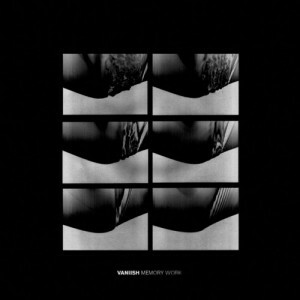 “Kaleidoscoped” is a fine introduction to Vaniish, a San Francisco post-punk outfit featuring members of Soft Moon and Wax Idols. Reverb blankets Keven Tecon’s melodic drone and Amy Rosenoff’s vigilant bass, delicately balancing gloom and glam. The introduction to Memory Work, “In Images,” boldly incorporates acid rock organ, revealing an album with more to offer than a goth retro fix. Rounding out the lineup are drummer Nick Ott and guitarist/keyboardist Adam Beck, who give industrial march “Fragment/Fatigue” an inky sheen. “Search and Replace” is a jolting standout, but the subsequent “Merge” hits an even deeper bittersweet spot. Dissonant interplay accentuates the woeful reverie, a perfect song for Vaniish to play when they want audiences to go from stoicism to reckless abandon. As Memory Work progresses, the psychedelic shoegaze eases in tempo but not intensity. Ominous “Observatory Time” smoothly transitions into the icy jangle of “Loss of Sensation.” All this anxiety leads to an unexpected conclusion. “La foi au fil de l’eau,” or “the faith over the water,” sounds like the album trailer for the follow-up to M83’s Hurry Up, We’re Dreaming. We’re looking forward to cheering Vaniish on when they perform these varied compositions live.